1. Seated on a bench, take a shoulder-width grip on the bar with your palms facing forward. 2. lower the weight slowly (in front) until it touches your upper chest. Secondary: lateral deltoid, triceps, trapezius, and upper pectoralis. Hand spacing: A shoulder-width grip is preferred to target the anterior deltoid. Wider grips on the bar minimize triceps contribution, but as the grip gets wider the risk of shoulder injury increases. 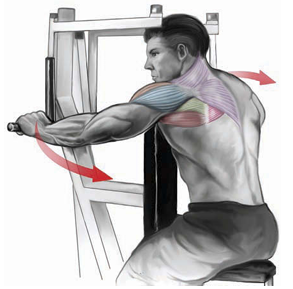 Range of motion: A shorter rep terminating the press Just before lockout keeps tension on the deltoid. Positioning: Performing the exercise while seated upright Is a stricter version than standing and prevents cheating the weight upward using momentum generated by the legs . Machines provide better stability and safety and offer a choice of handgrlps. A neutral grip (palms facing together) targets the anterior deltoid better than a pronated grip (palms forward). Behind-the-neck press: This version places the shoulder in more external rotation, and the risk of shoulder injury is greater when the weight is lifted behind the neck. 1. Seated on a bench, begin with the dumbbells at shoulder level, palms facing forward. 2. Press the dumbbells vertically upward until your elbows lock out. 3. Lower the dumbbells back down until they touch your shoulders. 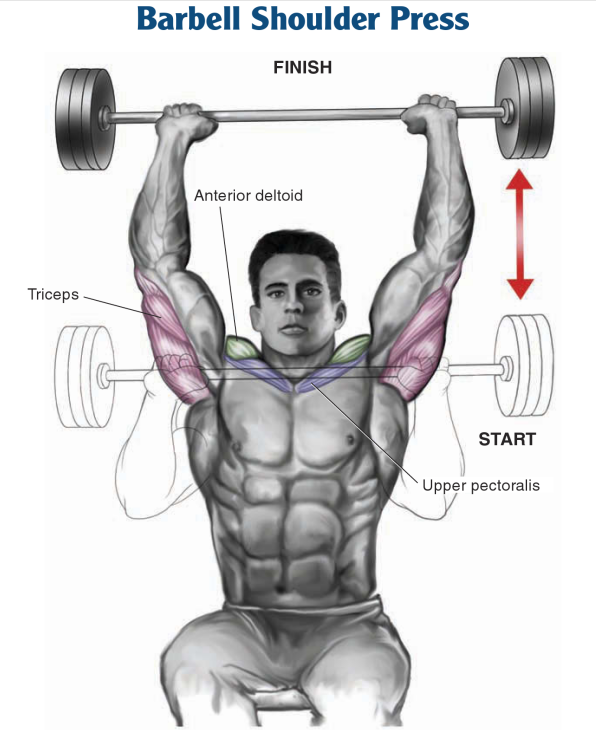 Secondary: Lateral deltoid, triceps, trapezius, upper pectoralis. Grip: Changing the orientation of the dumbbells affects hand position (grip). Pressing the dumbbells upward with palms facing forward (pronated grip) works both the anterior and the lateral heads of the deltoid. 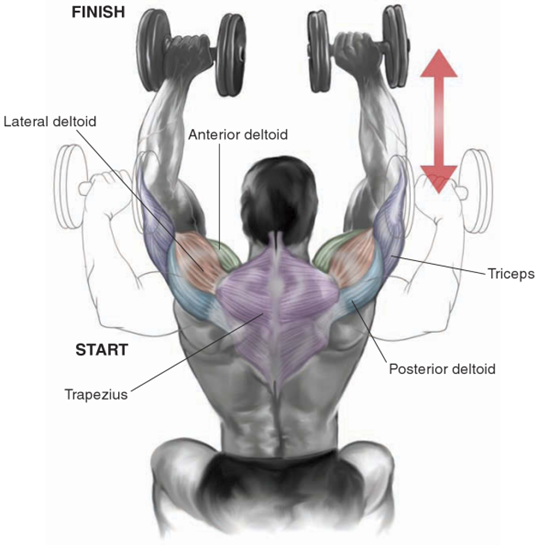 Pressing the dumbbells with palms facing together (neutral grip) makes the anterior deltoid work harder, minimizing lateral head involvement holding the dumbbells with palms facing backward (supinated grip) maximizes anterior deltoid effort. Positioning: Performing the exercise while seated upright is a stricter version than standing and prevents cheating the dumbbells upward using. This version uses three different hand positions during the repetition. Begin the exercise by holding the dumbbells with your palms facing back (supination). During the press, rotate the dumbbells so your palms face together (neutral grip) at the midpoint, finishing the upward press with your palms facing forward (pronated grip) at lockout. 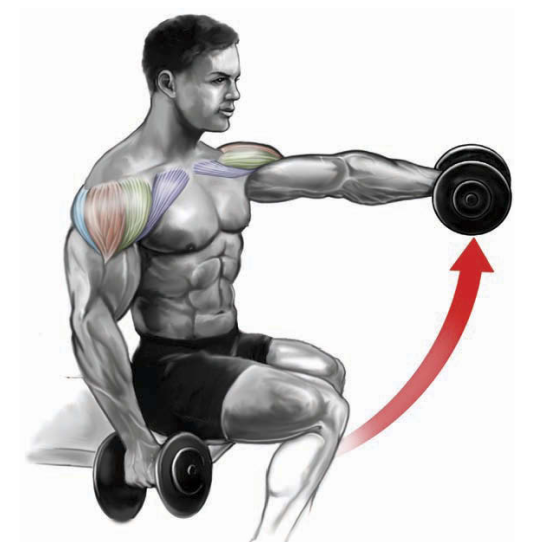 Alternating one-ann dumbbell press: Perform the exercise by pressing one dumbbell at a time, altemating right arm then left arm. 1. Sitting upright on the edge of an exercise bench, hold a pair of dumbbells at arms’ length by your sides, thumbs pointing forward. 2. Lift one dumbbell out in front up toward shoulder level, keeping your elbow stiff. 3. Lower the weight back down to the start position, and repeat with the other dumbbell. 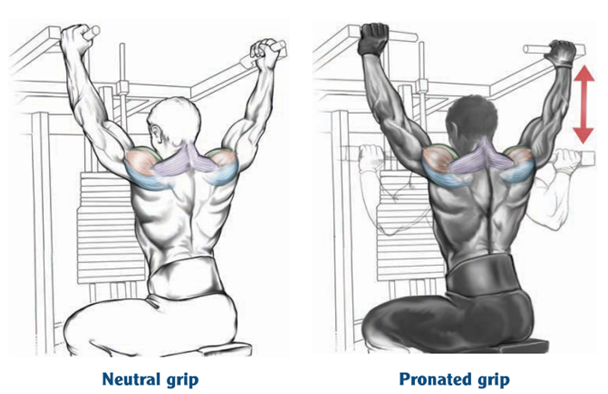 Grip: A neutral grip (palm inward, thumb pointing forward) emphasizes the anterior deltoid. A pronated grip (palm down) allows the lateral deltoid to assist. Begin with a neutral grip (thumb forward), then rotate the dumbbell through 90 degrees during the lift so that your grip is pronated (palm down) at the top. 1. Using an overhand shoulder-width griP. hold a barbell at arms’ length in front of your thighs. 3. Lower the barbell back down to your thighs. Secondary: Lateral deltoid. trapezius, upper pectoralis. 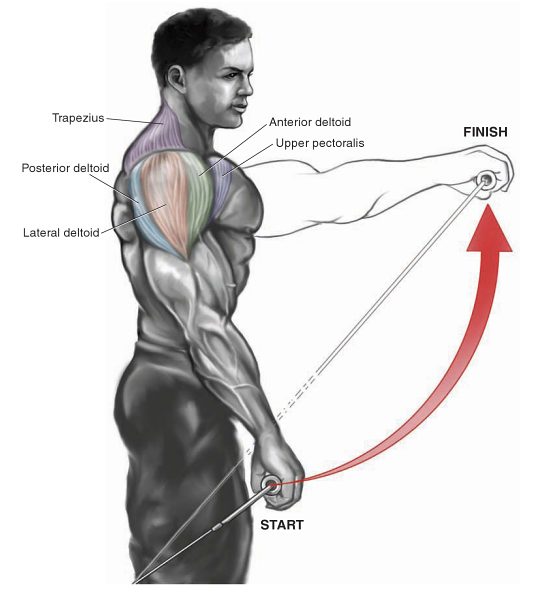 Hand spadns: Narrow hand spadng emphasizes the anterior deltoid, whereas a wider grip requires lateral deltoid assistance. Grab a dumbbell with both hands, Interlocking your fingers around the handle. The neutral grip (thumbs pointing forward) and narrow hand spacing target the anterior deltoid, minimizing Involvement of the lateral deltoid. 1. With one hand, grab the D-handle attached to a low pulley, using a pronated grip (palm down). 2. Facing away from the weight stack, raise the handle In an upward arc to shoulder level, keeping the elbow stiff. 3. Lower the handle back down to waist level. Secondary: Lateral deltoid, trapezius, upper pectoralis. Facing away from the machine with the cable running between your legs, grab the bar with both hands, using a shoulderwidth overhand grip. Rope attachment: Facing away from the machine with the cable running between your legs, grab the rope ends with both hands, thumbs pointing upward. 1. While standing upright, hold dumbbells at arms’ length. 2. 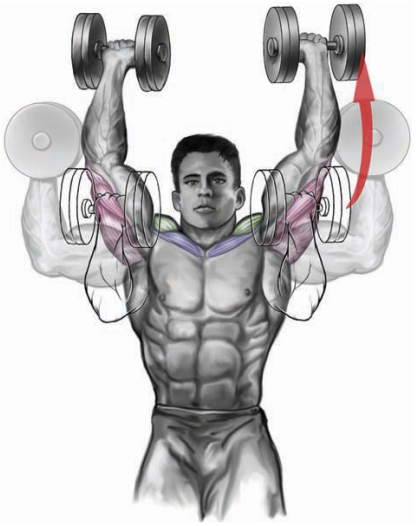 Raise arms out to the side in an arc until dumbbells reach shoulder level. 3. Lower dumbbells back down to hips. Secondary: Anterior deltoid, posterior deltoid, trapezius, supraspinatus. 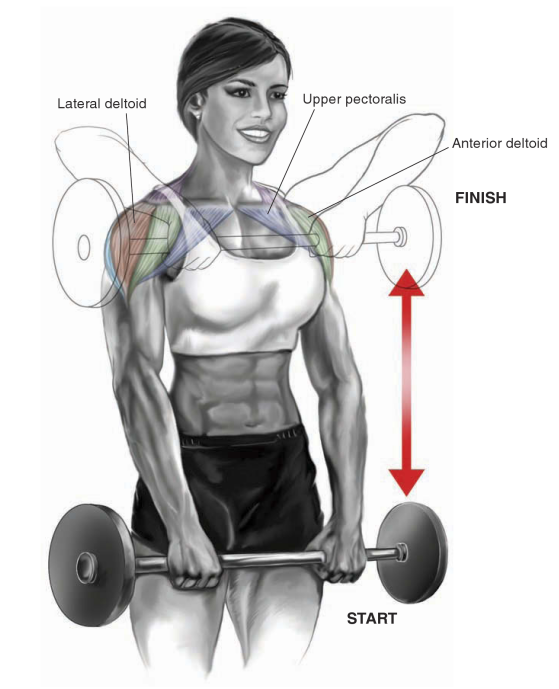 Range of motion: The lateral deltoid performs most of the work as the dumbbells are raised up to shoulder level. The trapezius takes over if the dumbbells are raised higher, so terminating the upward phase at shoulder level keeps tension on the deltoid. 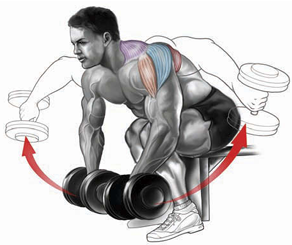 Grip: Effort from the lateral deltoid is maximized when the dumbbells are held parallel to the floor. 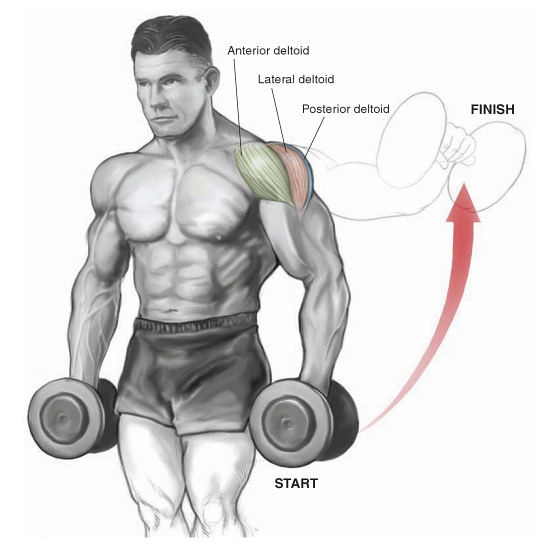 Tilting the dumbbells with thumbs up externally rotates the shoulder and makes the anterior deltoid contribute to the motion, whereas tilting the dumbbells with thumbs down internally rotates the shoulder, allowing the posterior deltoid to assist. 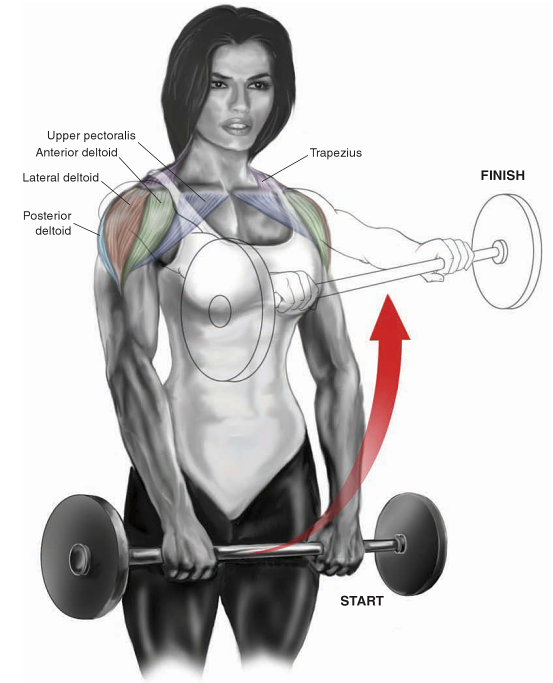 Trajectory: Lifting the dumbbells directly out tothe side hits the lateral deltoid. 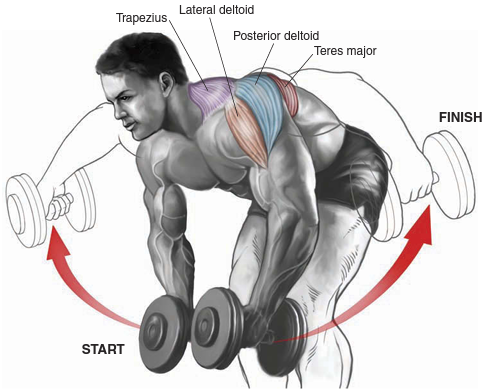 Raising the dumbbells from in front of the hips with a forward arc makes the anterior deltoid assist. If the arc of motion occurs behind the plane of the body, then the posterior deltoid contributes to the lift. Resistance: Because of the effect of gravity on the dumbbells, resistance Is lower at the beginning of the movement and gradually Increases to a maximum as the dumbbells are raised to shoulder level. Seated dumbbell lateral raise: Performing the dumbbell lateral raise seated on a flat exercise bench Is a stricter version of the standing dumbbell lateral raise, minimizing the use of momentum to swing the dumbbells upward. One-ann dumbbell lateral raise: You can perform this exercise using one arm at a time, stabilizing your torso with your free hand. 1. With one hand, grasp the D-handle attached to a low pulley. Range of motion: Terminating the upward phase at shoulder height keeps tension on the lateral deltoid. 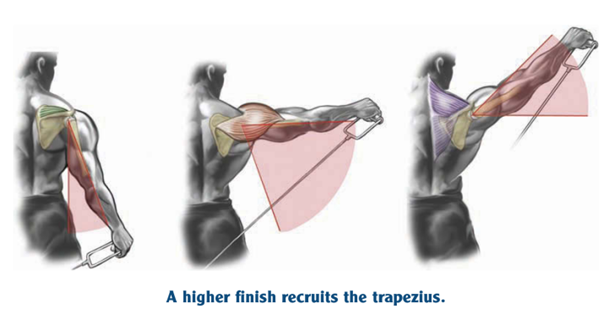 If the handle is raised higher, the trapezius takes over the work. The supraspinatus assists the lateral deltoid during the first 30 degrees of the movement. Starting the repetition with your hand In front of the opposite thigh can increase the range of motion by extending the early phase of the movement. Trajectory: The lateral deltoid is targeted best when the hand Is raised directly out to the side. 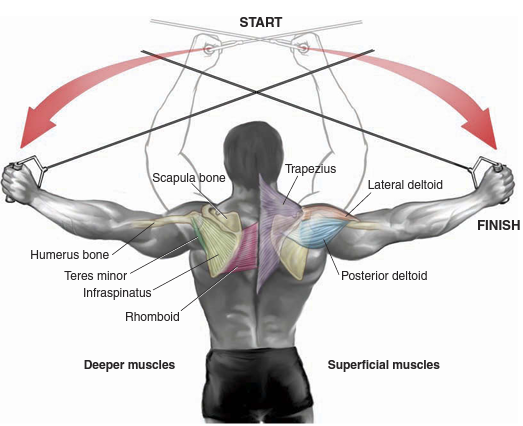 Performing the raise in front of the plane of your body activates the anterior deltoid, whereas raising your hand from the rear activates the posterior deltoid. 2. Raise your elbows to shoulder level, upper arms parallel to the floor. 3. Lower elbows back down to your sides. Range of motion: Machine raises provide a uniform resistance throughout the movement. The supraspinatus assists at the start, and the trapezius assists if the elbows are raised above shoulder level. Grip: A pronated grip (palms down) internally rotates the shoulder and targets the lateral deltoid. A neutral grip (palms fadng in) or supinated grip (palms up) externally rotates the shoulder and Increases the contribution of the anterior deltoid. Changes in shoulder rotation are made easier by gripping the elbow pads and not holding onto the machine’s handles. Trajectory: Altering the trajectory of the 11ft changes the relative focus on the deltoid. Raising your elbows directly out to the sides hits the lateral deltoid. 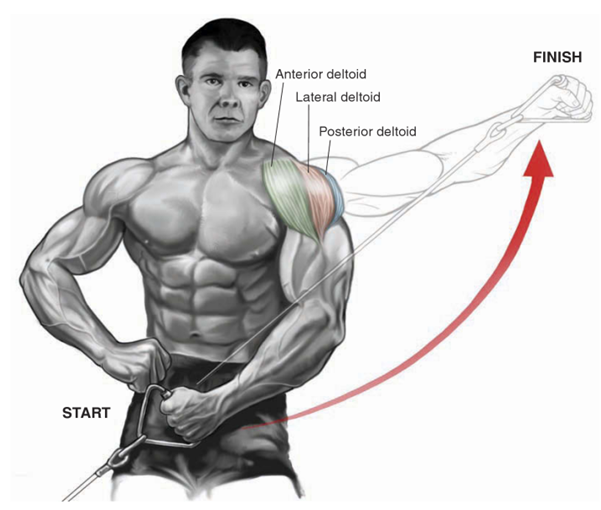 Performing the raise with your elbows positioned forward on the pads makes the anterior deltoid assist. You can perform this exercise using one arm at a time to improve focus and isolation. Some machines are designed so that you face inward, stabilizing your torso against a chest pad. 1. Hold a barbell at arms’ length using an overhand shoulder-width grip. 2. Pull the bar vertically upward, raising the elbows to shoulder height. 3. Lower the bar slowly down to the arms’ extended position. Secondary: Anterior deltoid, supraspinatus, Infraspinatus, teres minor. Hand spacing: Taking a wider grip on the bar helps target the deltoid, whereas a narrower grip emphasizes the trapezius. 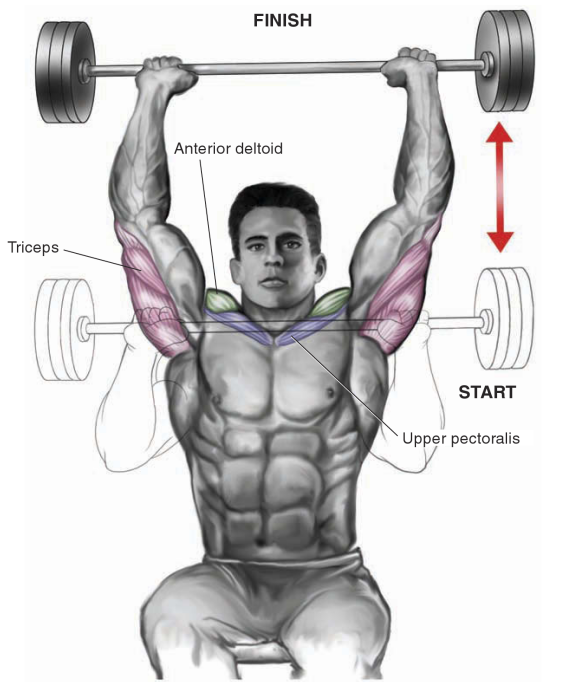 Trajectory: Lifting the barbell close to the body targets the lateral deltoid,whereas raiSing the bar through a forward arc away from the body requires assistance from the anterior deltoid. Range of motion: If the elbows are raised above shoulder level, the trapezius takes over the work. Cable upright row: Using a straight bar attached to the low pulley of a cable machine provides steady resistance throughout the movement. Machine upright row: Using a Smith machine provides a single plane of vertical motion that may help focus your effort. 1. Holding two dumbbells at arms’ length, bend forward at the waist, keeping your back straight and head up. 2. With palms facing together, raise dumbbells upward to ear level, keeping elbows slightly bent. 3. Lower dumbbells back down to start position. Secondary: Lateral deltoid, trapezius, rhomboids, infraspinatus, teres minor, teres major. Grip: The way you hold the dumbbells influences the degree of rotation at the shoulder joint. Holding the dumbbells using a neutral grip (with thumbs pointing forward) allows the lateral deltoid to work in the exercise. 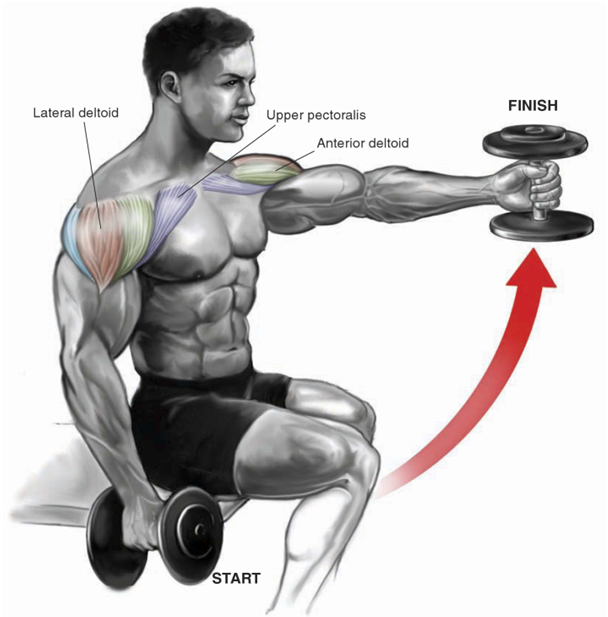 A pronated grip on the dumbbells (with thumbs pointing inward) targets the posterior deltoid because the shoulder is rotated internally and the action of the lateral deltoid is reduced. Resistance: Because of the effect of gravity on the dumbbells, the resistance is lower at the beginning of the movement and gradually increases to a maximum as the dumbbel ls are raised. 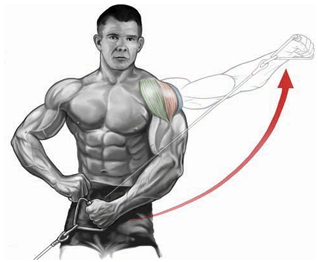 Trajectory: Altering the trajectory of the lift changes the relative focus on the deltoid. 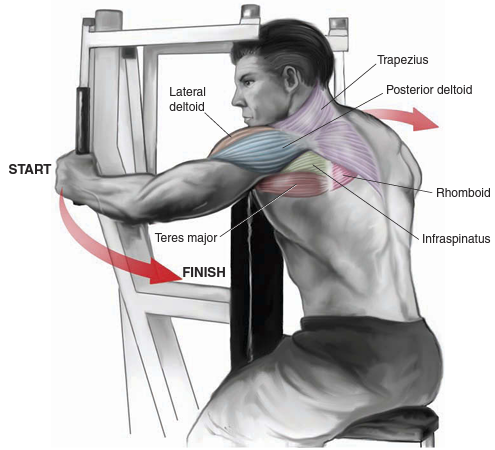 With your torso f lat and parallel to the floor, emphasis is placed on the posterior deltoid. If your torso is inclined with your chest upright, the lateral deltoid contributes to the movement. You can do this exercise with your forehead supported on the uppermost end of an incline exercise bench. Stand behind and in line with the bench, bend forward at the waist until your head touches the top of the backrest (which should be set at an appropriate height for your torso to be almost parallel to the floor). Supporting your head restricts movement in the spine and prevents swinging the dumbbells upward with momentum. Sit on the end of an exercise bench while bent forward at the waist with your chest resting on the thighs. 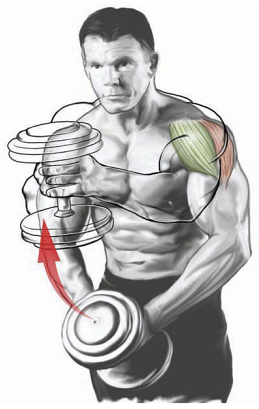 Note the pronated grip on the dumbbells (thumbs pointing inward), which improves isolation of the rear deltoid. 1. Grab the handles attached to two low pulleys Oeft-side handle in right hand, right-side handle in left hand), stand In the middle, then bend forward at the waist with back straight and parallel to the floor. 2. Raise your hands upward in an arc to shoulder level, such that the cables cross over. 3. Lower the handles back down to the start position, your right hand directly in front of the left ankle and your left hand in front of the right anlde. 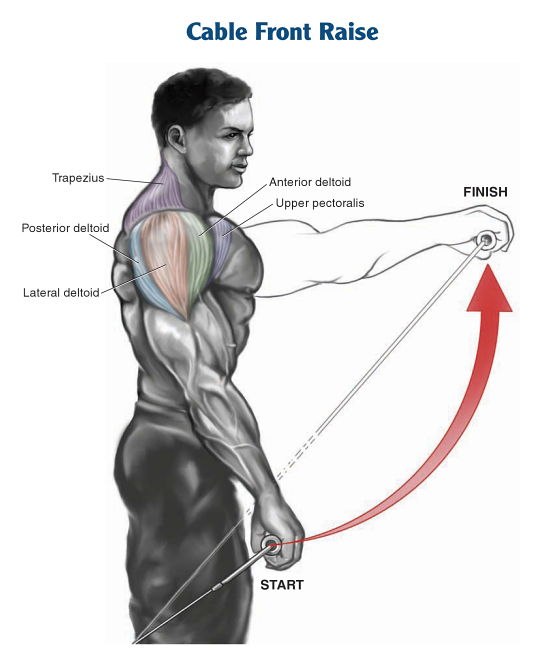 Trajectory: To target the posterior deltoid, your arms should move directly out to the sides. If your hands are raised In a forward arc In front of your head, the trapezius and lateral deltoid contribute to the exercise. Body position: Isolation of the posterior deltoid is better with your torso parallel to the floor, not in dined with your chest and head uppermost. Range of motion: The range of motion at the start is increased if the hands are allowed to cross over (uncrossing the cables) as the handles are lowered. The added distance and further stretch make the posterior deltoid work harder. Resistance: Unlike dumbbell raises, where the resistance varies during the 11ft, the cable pulley affords a uniform resistance throughout the motion. Grip: The cable handle does not allow you to make changes In hand position or grip. You can do this exercise using one arm at a time, allowing you to alter the range of motion by adjusting the start or finish positions. This unilateral version makes it possible to raise your hand higher and get a longer sbetch at the bottom, thereby generating more work for the posterior deltoid. Stabilize your torso by resting your free hand on the thigh. 2. Pull your hands backward (and slightly down) in an arc, arms nearly parallel to the floor until your hands are In line with your shoulders (forming a n.
3. Return the handles back to the start position where your right hand is directly in front of the left shoulder and your left hand in front of the right shoulder. Trajectory: to target the posterior deltoid, your arms should move directly back (and downward slightly) almost parallel to the floor. If the hands are raised through a higher arc to a point above shoulder level, the trapezius and lateral deltoid make a bigger contribution to the movement. 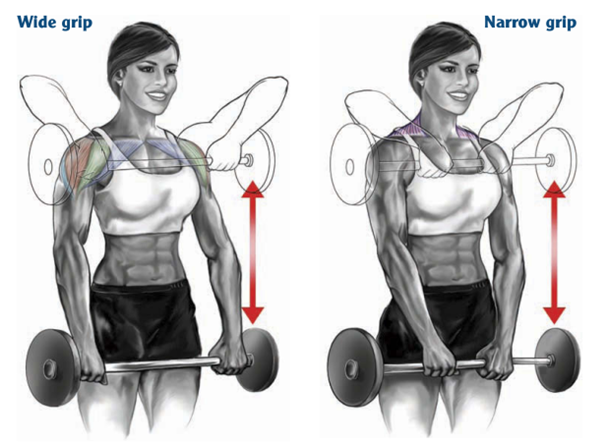 Body position: The posterior deltoid is best targeted with your torso upright, not leaning too far forward or back. 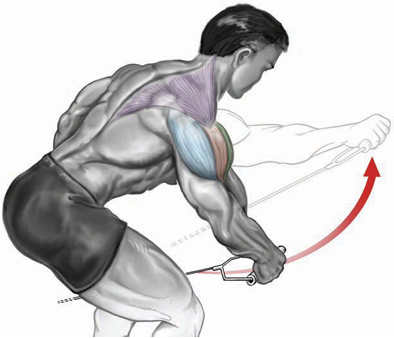 Range: Crossing your hands over one another (uncrossing the cables) at the start position increases the range of motion and muscle stretch, thereby making the posterior deltoid work harder. 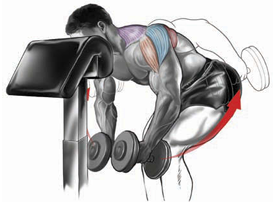 Supported reverse cable crossover: You can do this exercise (seated or standing) either with the chest supported on the backrest of an incline exercise bench or with the chest against the pad of a preacher bench. The bench is positioned centrally between two cable pulleys. Whether you sit on the bench or stand over it is optional, but you must be positioned high enough to allow the arms to perform the exercise without obstruction, with the pulleys level or just higher than your head. This variation is easier on your lower back, so you can focus on working the deltoid. 1. 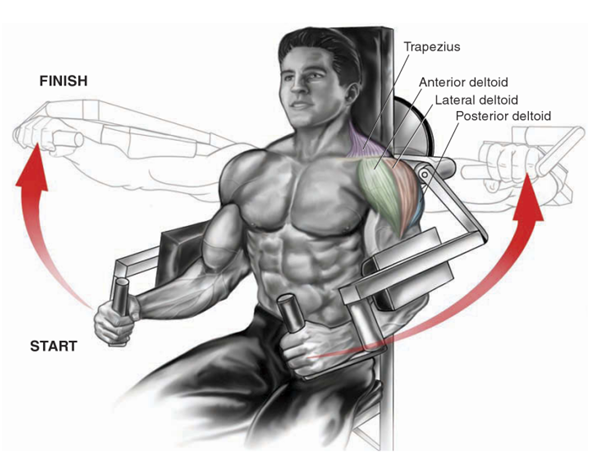 Sit facing the rear deltoid machine with your chest against the backrest, and grasp the handles directly in front with arms outstretched at shoulder. 2. Pull the handles back in an arc as far as possible, keeping your elbows high and arms parallel to the floor. 3. Return the handles to the start position directly in front. Secondary: Trapezius, rhomboids, lateral deltoid, infraspinatus, teres minor, teres major. Resistance: Like cable exercises, the rear deltoid fly machine provides a uniform resistance throughout the range of motion. This machine also offers several technical adjustments to grip. trajectory. and range of motion to help isolate the posterior deltoid. Grip: Most modern rear deltoid fly machines provide a choice of handles: one pair horizontal and the other pair vertical. How you hold the handles affects the degree of rotation at the shoulder joint. 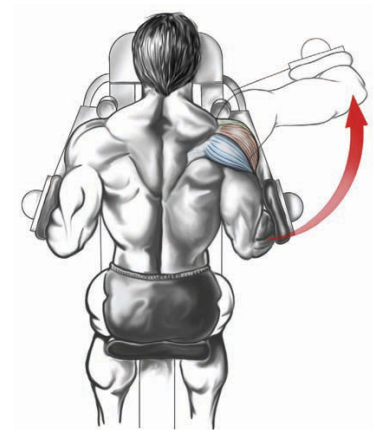 Using the horizontal handles with a pronated grip (palms down) is the best method of isolating the posterior deltoid because the shoulder is internally rotated. A neutral grip (thumbs up) using the vertical handles allows the lateral deltoid to participate because the shoulder is externally rotated. Range: You can increase the range of motion by performing the exercise with one arm at a time (see Variation section). 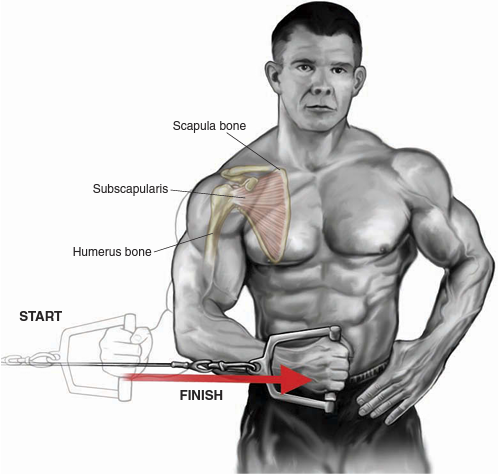 One-arm variation: Performing this exercise with one arm at a time reduces the relative contribution from the trapezius and the scapular retractor muscles, which thereby aids posterior deltoid isolation. You can also modify the range of motion during the one-arm version by changing your seating position on the machine. Sitting side-on with your inner shoulder against the backrest and performing the exercise using the outermost arm enable you to begin the exercise from a more distant start point beyond the opposite shoulder. This adjustment provides a greater stretch of the deltoid and increases the effective range of motion by as much as one third. 1. Stand sideways alongside a cable pulley adjusted to waist height, and grasp the handle with your outside hand, thumb pointing up. 2. With your elbow held firmly against your waist, move the handle in an outward arc away from your body, keeping your forearm parallel to the floor. 3. Slowly return the handle to the start position in front of your navel. Trajectory: During this movement, external rotation occurs at the shoulder joint from the combined action of the infraspinatus and the teres minor. Your hand moves in a horizontal arc with the forearm parallel to the floor. The upper arm is vertical, and your elbow is tight against your side. Range: Your hand oves through an arc of approximately 90 degrees, like the hand of a clock moving between 10 and 2 o’clock. Resistance: You cannot perform this exercise with a dumbbell while standing upright, because gravity does not provide resistance for the rotator cuff. Lie across a flat exercise bench resting on your upper back, keeping your elbow in contact with the bench. Begin with your forearm vertically upward then lower the dumbbell down in a forward arc toward your waist until your forearm is parallel to the floor. Lie side-down on a fl at exercise bench while holding a dumbbell in your upper hand. 1. Stand sideways alongside a cable pulley adjusted to waist height, and grasp the handle with your inside hand, thumb pointing up. 2. With your elbow held firm against your waist, pull the handle inward across the front of your body, keeping your forearm parallel to the floor. 3. Slowly return the handle back to the start position. Trajectory: During this movement , the action of the subscapularis causes internal rotation at the shoulder jOint. Your hand moves through a horizontal arc across the front of your torso, and the forearm remains parallel to the floor. The elbow and upper arm are held tight against the side of your body. Range: Your hand moves through a 90-degree arc, like the hands of a clock moving between 10 and 2 o’clock. Lie across a flat exercise bench, resting on your upper back with your elbow in contact with the bench. Begin with your forearm out to the side, almost parallel to the floor, and then raise the dumbbell in a forward arc toward vertical. 1. Lie sideways on a bench with your torso inclined at 45 degrees supported by your underside arm. 2. With an overhand grip, raise the dumbbell upward to head height, keeping the elbow stiff. 3. Lower the weight back down to waist level. Secondary: Lateral deltoid, anterior deltoid. Range: The supraspinatus initiates the arm raise, acting as the primary muscle during the first 15 to 20 degrees of abduction. 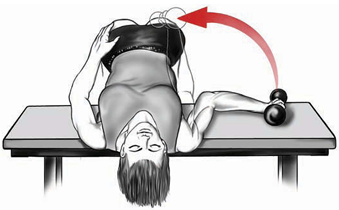 Gravity on the dumbbell in the inclined position causes resistance to be highest during the early phase of the inclined raise, focusing effort on the supraspinatus. 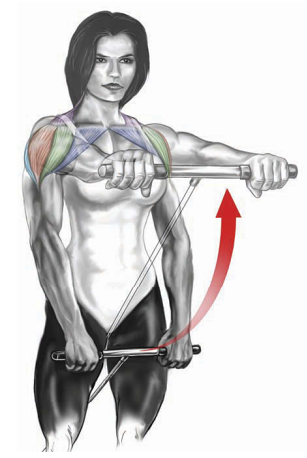 Trajectory: The supraspinatus is best isolated when the dumbbell is raised from in front of the hips. Grip: A pronated grip (palm down) works best. 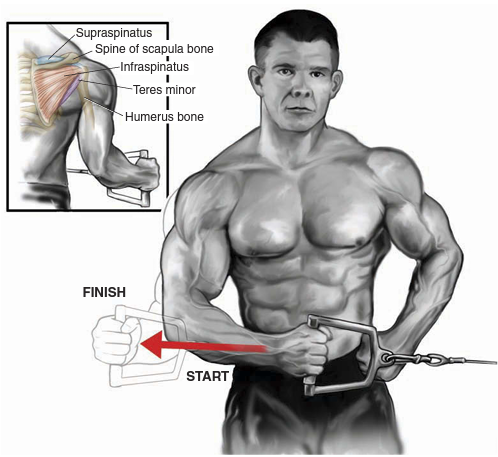 The supraspinatus initiates the arm raise and is active during the f irst 60 degrees of the movement. To focus on the rotator cuff muscle, terminate the upward phase when your hand reaches chest level.